For most Penguins fans who heard about the Letang signing there were some mixed emotions, though by and large the majority seemed to be quite pleased with it as evidenced by the poll you see on the right. Now Kris has been a pretty big part of the Penguins organization and has had some big plays over the past few seasons. We all remember last years OT goal to beat the Caps preventing a 3-0 series deficit. Likewise we’re all aware of Letang’s puck handling ability as well as the capability of scoring in the shootout; his prowess resides in his offensive ability. He has certainly had some great plays and at times shows himself to be a physical player. But for some of the more astute penguin fans there is some cause for concern. While Letang has been what I would consider a steal over the past few seasons making around $600k per season, we have to ask: Is he really worth $3.5MM a season? 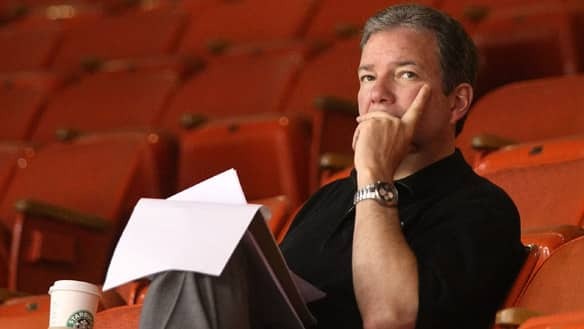 Or is it too early to question the genius of Ray Shero? I would have to say as of now yes, it is in fact too early. But when looking at the numbers for Letang this season you might be able to make a case for it. This season Kris has put up some pretty poor numbers offensively. He’s currently sixth on the team in shots on goal with a pitiful 1.8% goal percentage, just 3 goals on 166 shots. At sixth place that puts him above two top 6 wingers (Dupuis and Fedotenko) and the Pens chief offensive defenseman Gonchar (though Gonchar has played 11 less games). Comparing this to last year, he ended up with fewer shots and yet more goals, 10 of 138 at 7.2%. Last evening against the Lightning we heard Bob Errey say Letang missed the net 6 times. And what that does is fudge the numbers a bit since missing the net doesn't count as a shot on goal. If it did, his percentage would be even lower. I don’t know how you feel about that but that’s just something that shouldn’t happen for a guy who just received an extension worth $3.5MM a season. One might reference Orpik’s contract with is worth $3.7MM per year and he has yet to score a goal this year. My response to that would be Oprik isn’t paid to score goals but to hand out Free Candy, among other defensive aspects. There were of course some other questions that arose after word got out of the amount of money given to Letang. The main thought… “What about Gonchar.” Being an UFA after this season the fans were sure Shero was going to make Gonch a number one priority. Though there’s talk of Gonchar wanting more money than what the Pens might have available. While the Letang signing doesn’t necessarily preclude Shero’s inertest in Gonchar, giving Letang a 550% increase in pay does say something about your priorities. When you take a browse NHLnumbers.com and look at the Penguins defense next year, only Orpik, Goligoski, and now Letang are as of now going to be on the roster. You'll likely not see McKee back next year and I'm guessing Leopold's stock will depend on how well he performs in the playoffs. Eaton is a considerable option if he doesn't command too much money. And more than likely Ben LoveJoy and/or Derek Engelland will make the permanent jump to the big leagues. Offensively Shero needs to be concerned with locking up Ponikarovsky and Matt Cooke, in my opinion. Poni may likely ask for around $3MM per year and Cooke around $1.5-2MM. Guerin and Fedotenko are likely going to hit the bricks and Letestu and/or Jeffery should get their promotion. The more you can talent you can breed within your own organization the better for sure. It keeps costs down for sure. With all that said we come back to the main issue: In conjunction with possibly resigning Gonchar (or just spending another $5MM on a top defenseman) is Kris Letang worth $3.5MM a year? My head is telling me no but my gut is telling me to trust Ray. Hey, he put together a Stanley Cup winning/caliber team. Likewise I firmly believe Letang possesses the ability to be worth even more one day, the question is whether he'll live up to it. I guess we'll see here in the playoffs and over the next few seasons.